Over the past year or more, Pat and John Nashmy have been kind enough to share several of their favorite recipes with me - some from ‘The Assyrian Cookbook’; some of their own creation. Pat made sour spinach and rice, one of their family’s Lenten specialties, for which John said he could not take the credit, as this came from their Assyrian cookbook. 1. Thoroughly wash spinach leaves to remove any sand or dirt. Chop into small pieces. 2. In a large skillet, combine spinach, rice, tomatoes and water. Mix well. Cover and simmer about 20 minutes or until spinach is tender and rice is cooked. 3. Add lemon juice and salt to taste. 4. In a separate pan, sauté the onions in olive oil until lightly browned. 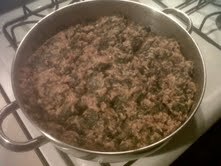 Add cooked onions to the spinach-rice mixture. Serve. I had to get on on the act, and put my own spin on their 'Sour Spinach with Rice' recipe. 2. In a separate large skillet, mixed together the spinach and diced tomatoes with half of the canned liquid; simmered them, covered, until the spinach began to wilt, about 15 minutes. 3. Seasoned with a little kosher salt. Added the pre-cooked rice, cooking until the rice warmed through, about 2 minutes. 4. Stirred in the lemon juice and cooked onions; simmered for another 2 minutes. Served. We loved the bright flavors from the tomato and lemon juice. This makes a perfect side dish for baked, broiled or grilled fish. Can you use frozen spinach instead of fresh? Yes. Frozen spinach can be substituted - just defrost it before using. So sad that I'm allergic to olive oil. Don't be sad. You can certainly use another type of oil in its place.